Incredible original artwork from Mike Zeck & John Beatty! Beautiful sketch of Black Suit Spider-Man! If you are a Spider-Man fan then this original sketch will look amazing displayed in your collection! The item "Mike Zeck & John Beatty Black Suit Spider-Man sketch! 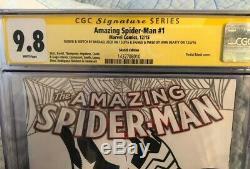 Original artwork CGC 9.8" is in sale since Thursday, March 21, 2019. 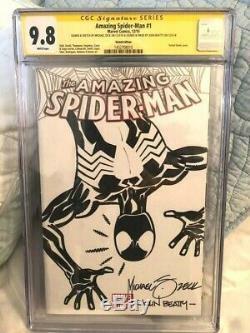 This item is in the category "Collectibles\Comics\Original Comic Art\Drawings, Sketches".x1ub7wb" and is located in Braintree, Massachusetts. This item can be shipped to United States, Canada, United Kingdom, Mexico, Germany, Japan, France, Australia, Denmark, Romania, Slovakia, Bulgaria, Czech republic, Finland, Hungary, Latvia, Lithuania, Malta, Estonia, Greece, Portugal, Cyprus, Slovenia, Sweden, South Korea, Indonesia, Taiwan, South africa, Thailand, Belgium, Hong Kong, Ireland, Netherlands, Poland, Spain, Italy, Austria, Bahamas, Israel, New Zealand, Singapore, Norway, Saudi arabia, Ukraine, United arab emirates, Qatar, Kuwait, Bahrain, Croatia, Malaysia, Chile, Colombia, Costa rica, Panama, Trinidad and tobago, Guatemala, Honduras, Jamaica, Viet nam, Uruguay.